With the rise of professional sporting teams depending on Big Data and the Internet of Things (IoT) to find talent, prevent injuries and win premierships, STEM jobs in sports are playing a starring role. Today, you will find data analysts, statisticians and IoT architects sitting alongside head coaches and executives when making crucial decisions on team selection and recruitment. 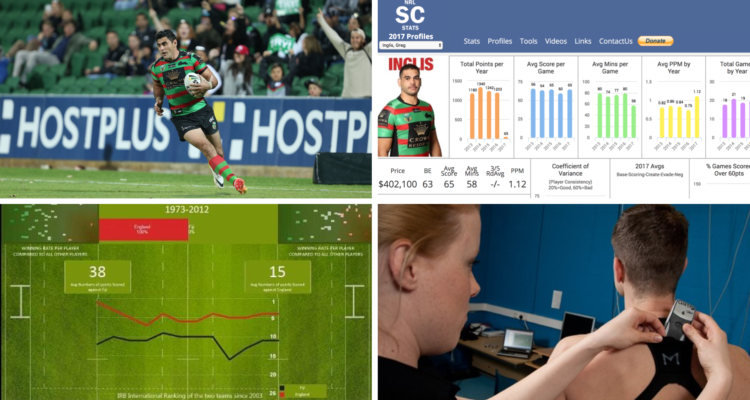 The South Sydney Rabbitohs are one such sporting team relying on the output of data to make better football decisions by using “Player Tracking”, which evaluates the efficiency of a team by an analysis of player movement. Cameras installed around the field and mounted on drones track the movements of every player and the football 25 times per second. The data collected provides innovative statistics based on speed, distance, player separation and ball possession. Some examples include how fast a player moves, how far they travelled during a game, how many times they touched the ball, how many passes they made, how many opportunities they had to score, and much more. In addition, sensors on the player’s bodies capture heart-rate and fitness information. To process this immense amount of data, many STEM professionals must work together. During any match or training day, statisticians are on the sidelines, sitting behind an array of laptops processing real-time data to capture as many as 5,000 basic stats throughout each game. The IoT architect ensures that each camera and sensor is capturing the correct data and relaying it back to a central database accurately and in real-time. They also ensure the security of the network to ensure data isn’t lost or hacked (potentially by another sports team). Then data analysts use their knowledge of football to create algorithms to make sense of the information coming from all the cameras and sensors. They specialise in understanding patterns and looking for anomalies which could indicate that something on the field isn’t working. Coaches then decipher this information to make the best decisions for the game and the team.